Legacy of Kain: Soul Reaver is a 1999 action game and sequel to Blood Omen: Legacy of Kain. It was ported to the Sega Dreamcast in 2000. Soul Reaver was developed by Crystal Dynamics, which had worked alongside Silicon Knights and Activision in the development of Blood Omen. After various disputes covering the direction and ownership of the franchise, Soul Reaver emerged as a property of the company, which was subsequently bought out by Eidos Interactive. Unlike Blood Omen which is a top-down 2D action game, Legacy of Kain: Soul Reaver is a 3D third-person "Metroidvania" action game, where the player, Raziel, travels across the world of Nosgoth seeking to harvest the souls of the vampires, led by Kain, who betrayed him. Throughout the adventure Raziel obtains new powers and abilities allowing him to access new parts of the map. A mechanic also exists to allow the player to shift between the "material" and "spectral" world. Legacy of Kain: Soul Reaver was set to be followed up by Legacy of Kain: Soul Reaver 2 on the Dreamcast, however Soul Reaver 2 would jump platforms to the PlayStation 2 and PC before being released in October 2001. Soul Reaver was originally developed with the PlayStation in mind, and for its time was highly regarded for its seamless open-world levels (i.e. being able to traverse from one of the map the other without the need for loading screens) and sound design. The Dreamcast version builds on what is seen on the PlayStation, running at 640x480 while targeting 60FPS (versus the 512x240 resolution of the PlayStation, where the game would target 30FPS). Draw distances are improved and polygon counts are increased for major characters such as Raziel and Kane (though levels and enemies use the same geometry as the PlayStation). Textures are generally more compressed on the Dreamcast and exhibit compression artifacts not seen in the PlayStation version, however in other cases (such as on Raziel's character model) the textures were upgraded. The lack of affine texture warping, common in 3D PlayStation games (and the aforementioned increase in screen resolution) generally leads to a better picture on the Dreamcast overall. Both the PlayStation and Dreamcast fail to reach their target frame rate most of the time. On the PlayStation, busy scenes cause slowdown, with the frame rate dipping to between 20 and 30FPS. On the Dreamcast, a double-buffer V-sync option is used, meaning that when the game cannot handle 60FPS, it immediately targets 30FPS, creating a more jarring experience as it attempts to avoid screen tearing. This affects the Dreamcast most in larger environments, though dips can occur whenever there is too much on screen. Some effects, such as the snow, are hard-coded to update at 30FPS. Controls are also less fluid than on the PlayStation, due in part to the lack of buttons and second analogue stick. On the Dreamcast, the camera is mapped to the D-Pad, meaning it is more awkward to both move and control the camera at the same time. While also ported to the PC, the PC version stems directly from the PlayStation original, and lacks the dynamic music of the console versions and higher resolution display of the Dreamcast version. Frame rate is also capped at 30FPS at all times. A significant amount of content was cut from Soul Reaver, in part due to development deadlines, but also due to technical challenges posed with the PlayStation hardware. The Dreamcast version does not re-add any of the missing content, which means the remnants of these missing features, such as corridors with dead ends, are still present. 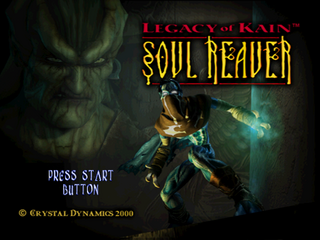 Main article: Legacy of Kain: Soul Reaver/Magazine articles.